A Saturday Afternoon of Jazz featuring Monnette Sudler. 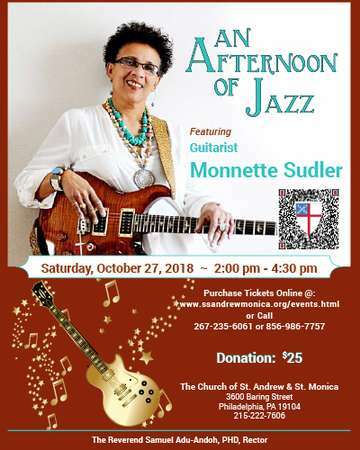 A Saturday Afternoon of Jazz featuring Philadelphia’s own Monnette Sudler is an American jazz musician, composer, and poet. Her primary instrument is the guitar. Monnette’s loves music by classic jazz guitarists she continues to be inspired by her family, colleagues and the communities where she has either lived or been of some service. Monnette grew up listening to Nat King Cole and the Motown sounds.